Wracking your brain to come up with a fun present for a family member? A photo collage, printed and framed, might be the perfect solution. Here, I’ll show you how to take a collection of your favorite photos and turn them into artwork using Shape Collage. Note that you can download and use the app for free, but unless you pay $25 for the pro version, a watermark appears on all collages. The pro version also offers other advantages, such as the ability to save your collage in Photoshop PSD format, edit your collage in either Photoshop or GIMP, and save your workspace and settings. The $45 commercial version is targeted to businesses. A photo collage requires many photos—perhaps over 100—so your first step is to collect up the photos you’d like to use and drop them into an easy-to-access folder. In iPhoto, choose File -> New -> Album, enter an appropriate name, and click Create. Now fill up that album with your favorite pics (or perhaps pics with a theme, such as family vacations or your grandchildren). Once you’re satisfied with your selections, click the album name (in the left sidebar) once to highlight it and then choose File -> Export. Use the pop-up menus to set the Kind pop-up menu to JPEG, the Quality to Maximum and the Size to Medium. Click Export, and then in the left sidebar, click Desktop. Now click New Folder, enter an appropriate name, and click Create. This adds a new folder to the Desktop, so that the exported photos will be easy to find. Finally, click OK to export the entire album to the new folder. Shape Collage makes it easy to put together a collage and customize it. Open the application; when it appears, you’ll notice that the main window is divided in three sections: Photos, Status, and at the right, a section for options. Now let’s get started! 2. Move over to Status and click Preview. This will show you a mockup of the current layout, which you’ll see chosen by radio button in the Shape and Size tab. We’ll change that now, though. Hop over to the options section, and click Shape and Size (if it’s not already selected). 3. 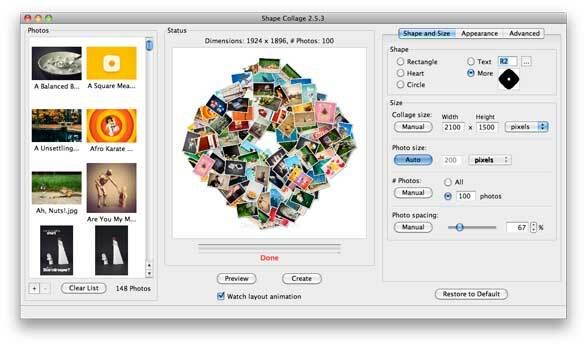 The Shape subsection allows you to set the shape for the collage. Three basic options are provided: rectangle, heart, and circle. You can also choose a letter or a word; clicking the ellipses next to the text option lets you select the font, set text spacing, or even choose a symbol (which is helpful if you’re looking for a specific dingbat). The “More” shape option allows you to choose a specific a custom shape. You can paint one yourself using the included brush tool, choose a preset such as a paw print or puzzle piece, or load any black-and-white graphic image in PNG format. (Just be sure that any art you create is simple and bold, because finely detailed line art will not work well.) Now pop back over to Status and click Preview to get an updated mock-up of your collage. It’s easy to add your own custom shape—just create black and white artwork in PNG format and then load it into Shape Collage. 4. The Size subsection allows you to determine the size of the collage and of the pictures within it. The most important consideration is the overall collage size, because you probably intend to print and frame the completed collage as a gift. Printed content should be at least 300 ppi (pixels per inch) in order to avoid obvious pixelation, and Shape Collage outputs all files at 300 ppi. So, think about the size of the frame you’d like to use for the collage and multiply each dimension by 300. A frame with a viewable portion is 7-by-5 inches means that you’ll need the collage size to be at least 2100-by-1500 pixels. So, click Auto (which, curiously, turns off the automatic sizing) and enter those numbers. Other sizing options allow you to determine the pixel size of each photo (which can increase the overall collage size), the number of photos in the collage (if you find that you too many) and how far apart the pictures are from each other. Once you’ve made your selections, click Preview (under Status) for an updated mock-up. 5. You can now fine-tune the collage’s coloring. Click Appearance, and you’ll see options for both Background and Border. You can choose any color you like for the background, although white is recommended; alternatively, you may want to choose a transparent background so that you can overlay the collage onto other artwork. You can also also choose a picture as a background, but that’s probably not a good idea; after all, you want the collage to stand out, not be drowned out by the picture it’s placed on. You can also change the color and size of the border (or turn it off completely), but changes here are discouraged—without a border, pictures will look indistinct from one another. 6. Clicking Advanced gives you one last chance to fine-tune things, including the randomness of the rotation and the angle, the photo shadow (which can be turned off), and well as an option for jagged boundaries (which makes the photos adhere less stringently to the shape border). Go back to Status and click Preview for one last mock-up, if necessary. Now that you’ve tweaked every detail of the collage, it’s time for the app to get to work. Click Create (under Status), and you’ll be asked to choose a place to save the file. You’ll also want to set the file format: if you’ve chosen a white background, I recommend you stick with the basic JPEG format; if you’ve opted for a transparent background, choose PNG. (PSD can only be selected if you’ve purchased the pro version of the application.) In moments, the full collage file is composed and saved to your hard drive. Print the file yourself (or take it to a printer), pop it in a frame, and then wrap it up. With a gift this unique, you’re guaranteed to impress on Christmas morning! Once you’ve tailored all the settings to your liking, click Create to create your custom collage! I chose Shape Collage for this project because of its ease of use, quick action, variety, and stunning output. However, there are other Mac collage apps out there that will facilitate the creation of collages with a somewhat different aesthetic. Collage utilities such as Jalada Collage, PearlMountainSoft's Collage It, and cf/x software's Collage all offer a different take on the art of collage. Your vision is the limit.